After determining which dining room table will suit your needs, it's time to pick the best dining room chairs for the table. 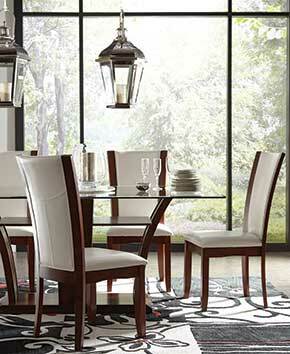 Knowing the height of your dining room table will help you choose chairs at a comfortable height for adults. Remember, although children may need booster seats now, they'll one day be able to sit at the chairs unassisted. Looking for unique sitting arrangements for your dining room furniture? Consider buying dining room bench-style chairs that allow more than one person to sit on the same piece of furniture. 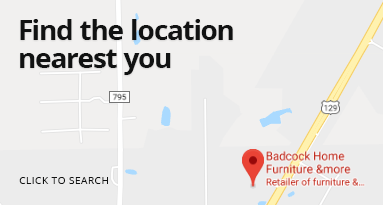 You can buy tables, chairs, and other dining room furniture at your local Badcock &more store. Found the perfect chair for your dining room? Be sure to check out our excellent financing options! The Ashleigh Collection chairs feature woven polyester seat covers for added comfort. Crafted from fine rubberwood and painted a sleek white color for a refined look. Constructed from hardwood solids and oak veneers, these upholstered side chairs are a charming addition to any dining set. With a washed gray oak finish, these pieces exude a feeling of coziness. Match them with the Brooklyn Collection table and elevate the style of your dining area. For family-style dining, an upholstered bench seat is also available in regular and counter height. It features a back for ultimate comfort. The X-back chairs rest on square legs with a chamfered foot and have a burnished, saddle brown finish. With a matching brown leather-look, the seat cushions are designed for easy care. The X-back chairs rest on square legs with a chamfered foot and have a burnished, saddle brown finish. The upholstered chairs have a burnished, saddle brown finish base and are available in neutral linen with tack trim. This beautiful collection offers a highly sophisticated look with a weathered grey finish. It’s available in regular and counter height and includes an impressive family-style upholstered bench with a back for ultimate comfort. This beautiful collection offers a highly sophisticated look with a weathered grey finish. The X-back chairs rest on square legs with a chamfered foot. 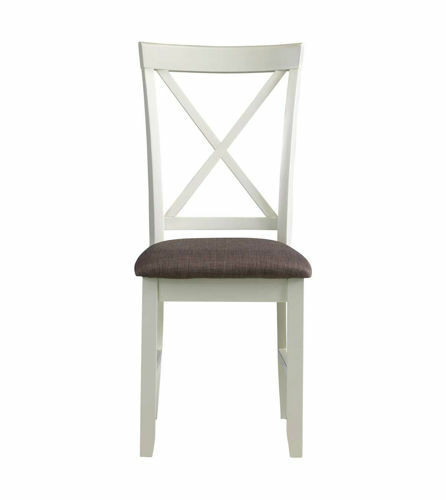 Beautiful upholstered chair in neutral linen with tack trim available in regular dining height or counter height. This storage bench seats two and nicely complements the side chairs and dining table with a unique storage option. It has upholstered seating in a grey, menswear-inspired fabric that is 100% polyester for easy care. It is constructed of rubberwood veneer and mango wood with a white finish. The Donovan x-back chairs have a comfortable, upholstered seat with a grey, menswear-inspired fabric that is 100% polyester for easy care. They are constructed of rubberwood veneer and mango wood with a white finish. Some assembly required. Your guests will feel like royalty in these regal tufted upholstered arm chairs with carved slat backs, ornate leaf and scroll top rails, reeded vase shaped legs and nailhead trim. Your guests will feel like royalty in these regal tufted side chairs with carved slat backs, ornate leaf and scroll top rails and reeded vase shaped legs. Constructed of exotic hardwoods and Mango veneers with a rich mango finish.